Bagel Wednesday at work — when our office provides (you guessed it) bagels for all employees on Wednesday mornings — is a highlight of my week. Also, a couple of weeks ago at the beach, Kevin and I hit up The Bagel Factory twice for breakfast (once on a Wednesday) and they were quite delicious. And so, when I decided to try making bagels at home for my next culinary adventure, Wednesday seemed to be the perfect day to do so. Alas, the baking adventure was slightly delayed. When I began shopping for groceries to make the bagels last week, I ran into one roadblock: malt powder. Kevin and I visited both Harris Teeter and Whole Foods here in Winston-Salem and had no luck. I spent some time on Google, and it didn’t look like any retailers here carry malt powder. This only made me more determined to hunt it down! 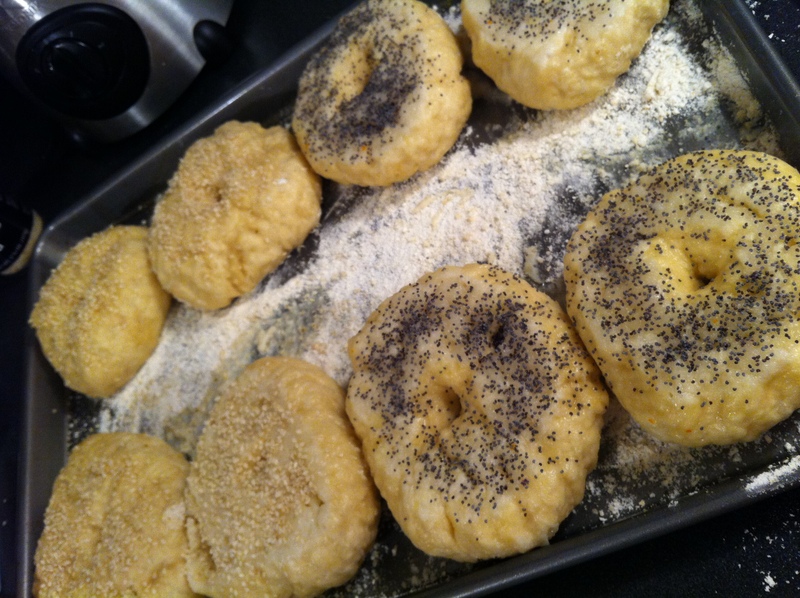 Bagel making is a two-day endeavor, so I started things off on Sunday evening with the first steps of the recipe. Stir the yeast into the flour in a large mixing bowl. Add the water and stir until all ingredients are blended. Cover with plastic wrap and allow to rise for two hours. 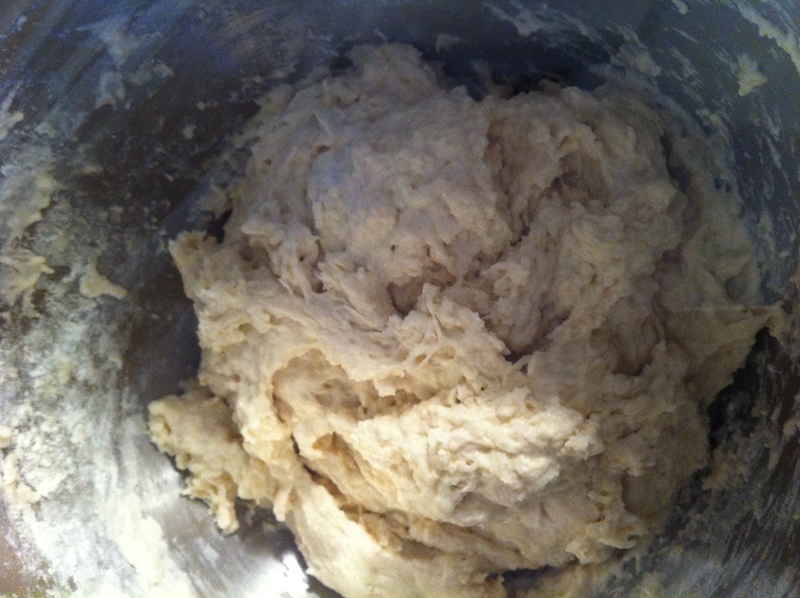 Pour the dough onto a clean surface and knead for 10 minutes. 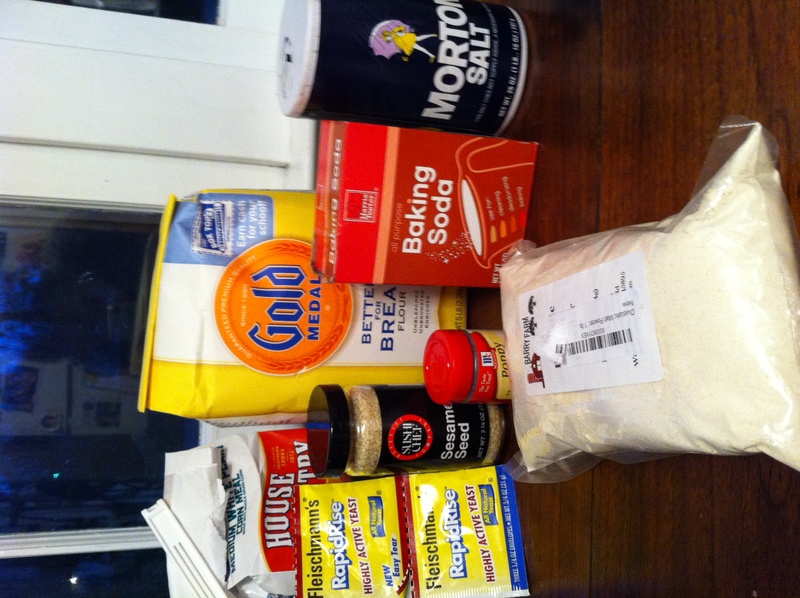 Work in the additional 3/4 cups of flour while kneading. 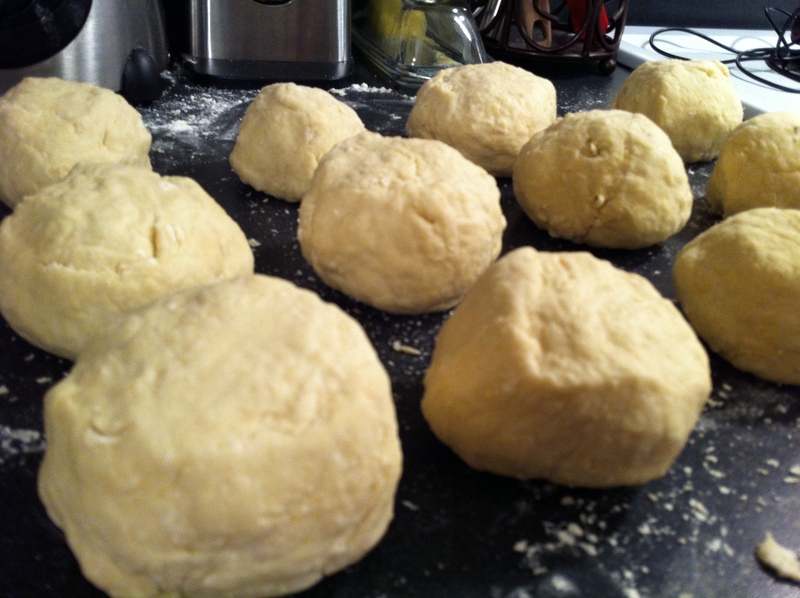 Immediately after kneading, split the dough into 12 small pieces. Roll each piece into a ball and set it aside. When you have all 12 pieces made, cover them with a damp towel and let them rest for 20 minutes. To shape the bagel, punch your thumb through the center of each piece of dough and then rotate the dough around your thumb. 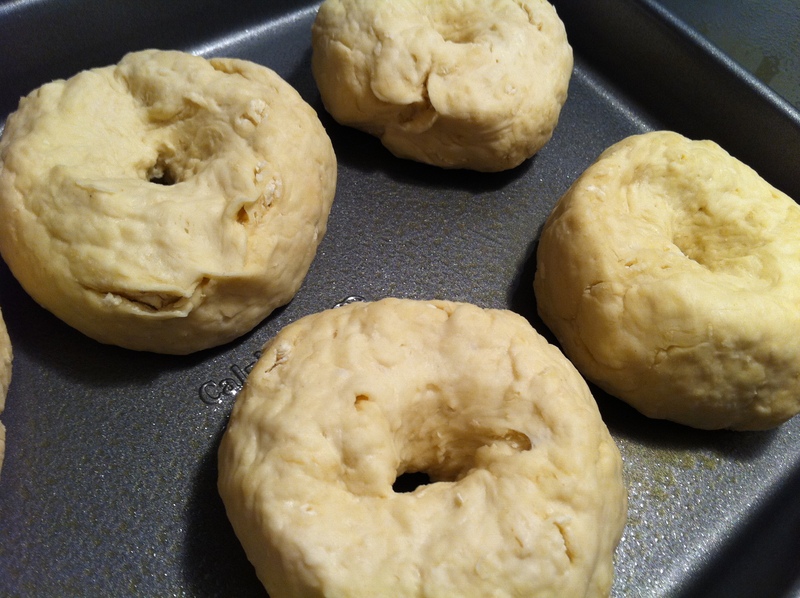 Place the shaped bagels on an oiled baking sheet, with an inch or so of space between one another (I used two smaller pans, which worked nicely for refrigerator space). Preheat the oven to 500 degrees. While the oven is preheating, bring a large pot of water to a boil, and add tablespoon of baking soda to the water (apparently this is to alkalize the water, replicating a traditional bagel flavor). 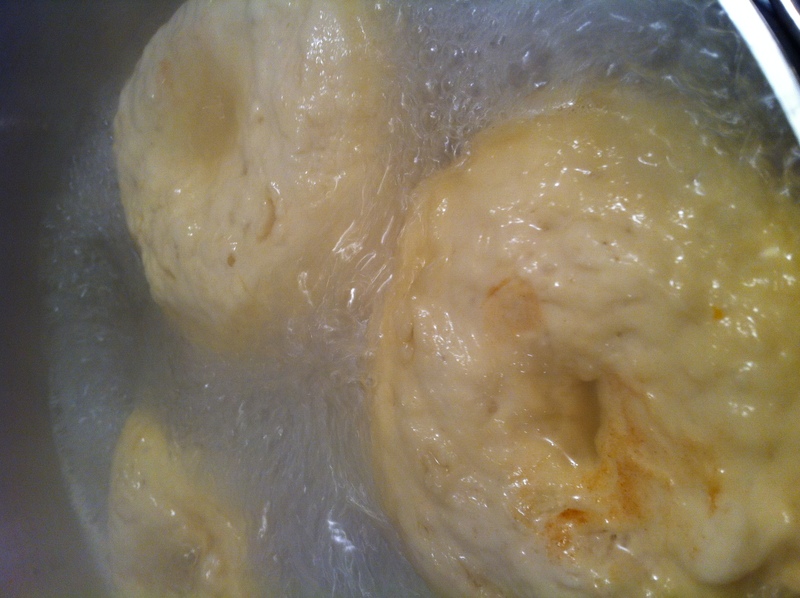 When the pot is boiling, drop a few of the bagels into the pot and let them boil for a minute or so (I boiled three bagels at once, which was manageable). Repeat this process until all of the bagels have been boiled and topped. Remove the pan from the oven and let cool slightly. 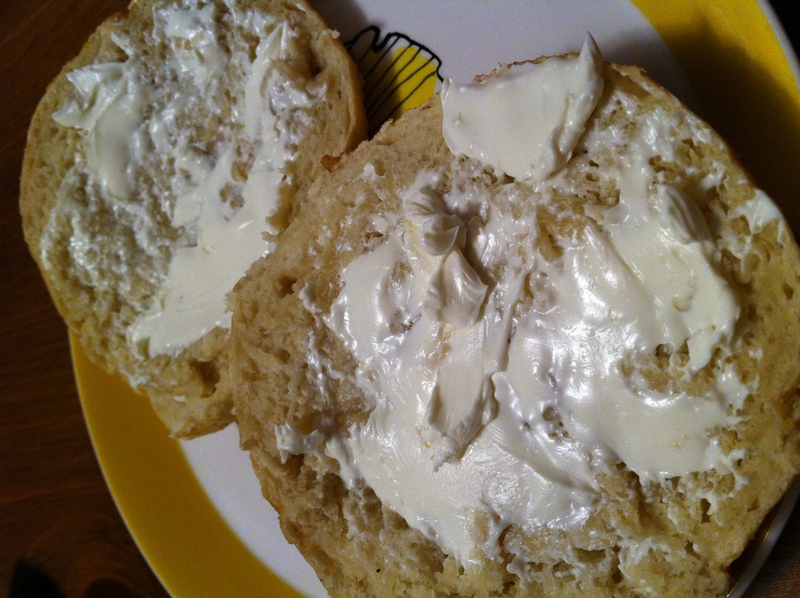 Top with cream cheese (or whatever your preferred bagel dressing might be) and enjoy! omg those look amazing anna!!! 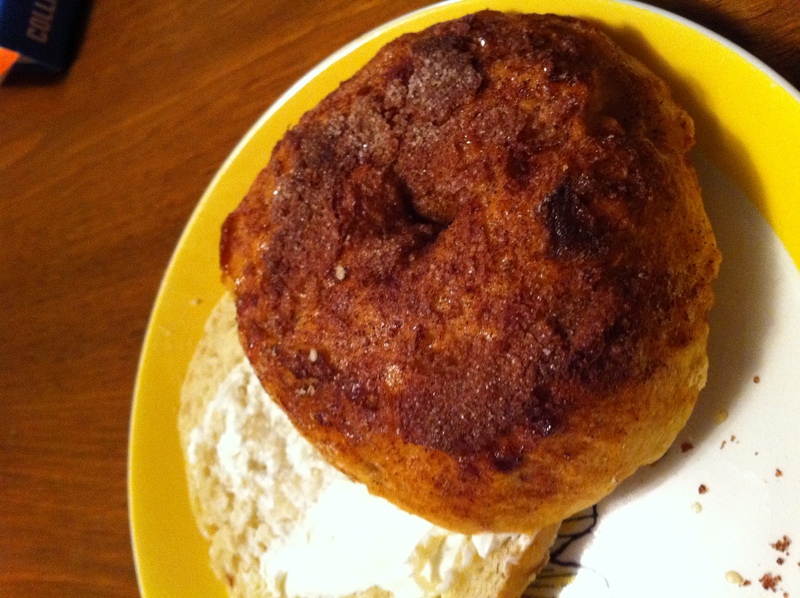 wow I dont’ think I will ever have the patience to make homemade bagels but they do look good!